We have a gem with us. In 2017, we introduced her as Ruby, our furry four-legged caregiver and therapy dog. Since then, we’ve received much interest about her and pet therapy, aka, Animal Assisted Therapy. As a handpicked Labradoodle, Ruby is highly trained and recognized by the American Kennel Club (AKC) as a certified therapy dog. She loves her time visiting children and adults in hospitals or in their homes, and she enjoys the special relationships she has meeting and greeting everyone. “The more I do this, I can clearly see that Ruby truly loves being with her clients,” says her handler, Carol Samples, RN, and CEO of Attention Plus Care. “She can connect and help people in ways where other treatments cannot. There is something happening beyond words that is exchanged.” Her natural talent for boosting morale can be life-changing for some and is both a product of her breed and her special training. Pet therapy, or Animal Assisted Therapy, has a positive effect on seniors. A one-year study of roughly 1,300 adults aged 65 or more years, published in the Journal of the American Geriatrics Society, found that companion animals had a positive effect on the activities of daily living (ADLs) of older adults. The study also found older adults had a decline in ADLs when they did not have pets, compared to similar groups with pets. A study in the Journal of Gerontology also found that a therapy dog had a positive effect on residents at long-term care facilities. Residents engaged with a therapy dog had a decrease in loneliness after the end of the six-week study. The study also found that one 30-minute session a week with a therapy dog gave significant reduction in participant loneliness. Animal Assisted Therapy for seniors also has been shown to help Sundowner’s Syndrome, and evening periods of agitation and confusion in those with Alzheimer’s disease and dementia. 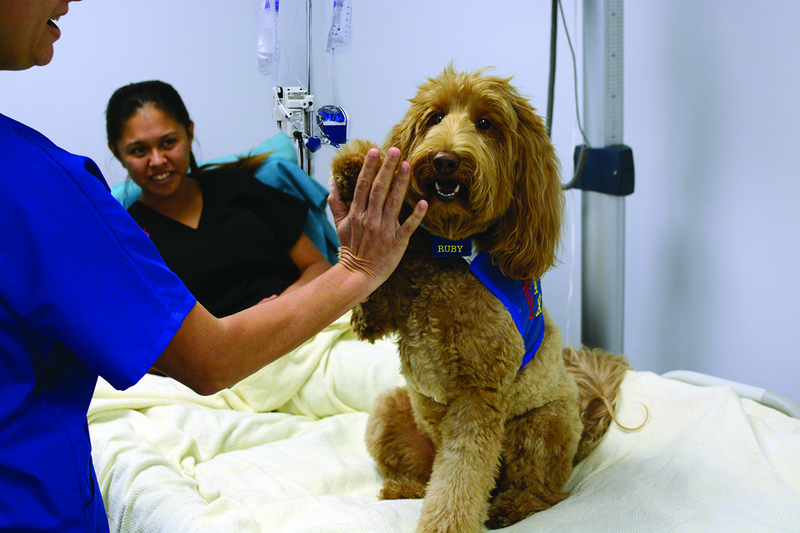 It’s often seen that touching and being touched by a therapy dog gives tactile and cognitive stimulation with patients, while improving their well-being. Dr. Michael McCulloch, a Portland, Oregon, psychiatrist, researches why pets are therapeutic. “Touch is one of our primary needs when we’re born and one of our last needs to go,” Dr. McCulloch states. These days, in a world of texting to “keep in touch,” therapy dogs know their companionship and furry touch are paws above a phone text. Just ask Ruby. She’ll high-five you! Available monthly: AGING IN HAWAII EDUCATIONAL OUTREACH PROGRAM by Attention Plus Care — A program to provide resources for seniors and their families, instructed by a registered nurse, who covers a different aging topic each month. For more information on Animal Assisted Therapy and free community workshops on Aging in Hawai‘i hosted by Attention Plus Care, call 808-440-9372.